It’s easy to make Half Your Plate veggies! 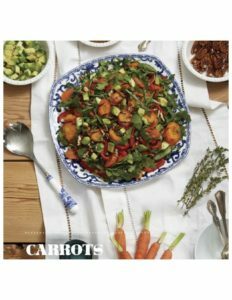 Peppery arugula is the base for this hearty salad with sweet grilled carrots tossed in a Maple-Dijon dressing with crisp red pepper strips, toasted pecans and chunks of creamy avocado. 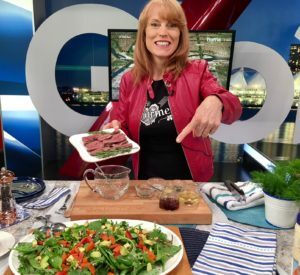 Click to watch: Here’s the recipe I featured on Global Vancouver! Grill extra carrots one night to use in this salad the next night. 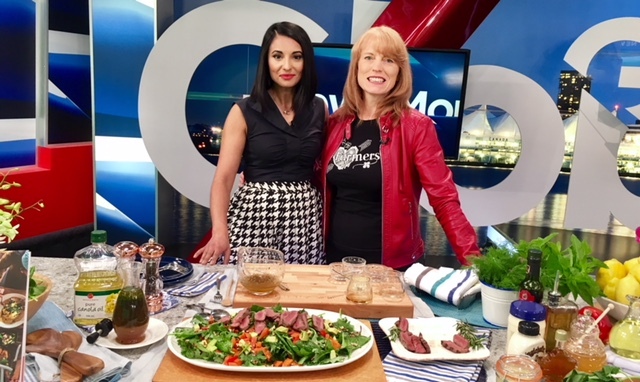 Good to know: Carrots sweeten up when grilled but still have enough bite to make them a hearty addition to this salad. And thanks to plant science, carrots are always one of the best healthy buys in the grocery store. 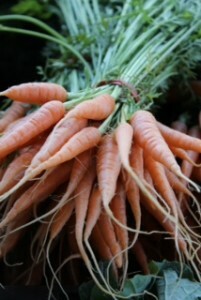 Without the option to use tools like pesticides, farmers would see their carrot crop cut in half! 2. Toss the carrots in canola oil before grilling. That helps the carrots from drying out and the fat in the oil will help you to absorb more beta-carotene (we turn that into vitamin A) from the carrots – cool huh! 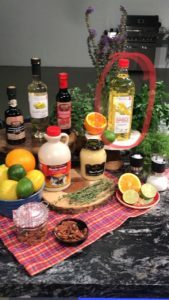 Why use canola oil in dressings? 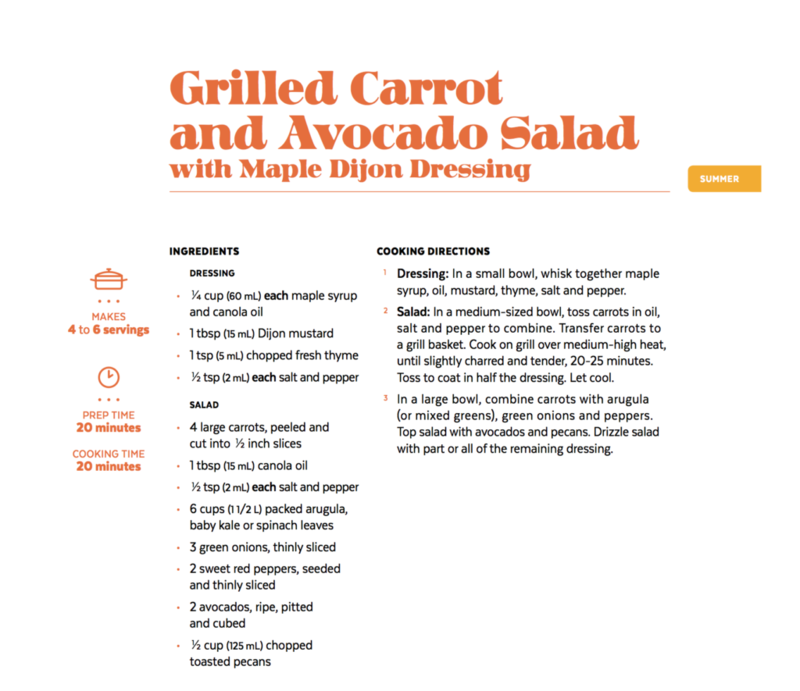 This easy Maple -Dijon dressing uses canola oil. Why? For one, it’s Canadian eh! We produce loads of it which is why it’s affordable (another plus). Second, it’s packed with omega-3 fats which we know are important for heart heart AND what I truly appreciate, it will not harden in the fridge. Always make extra dressing cause you know you’ll use it up by the end of the week. Keep portions to about the size of a deck of cards – that’s all you need to pack a wallop of hunger-curbing protein and all for less than 200 calories per 75 gram serving. TIP: Ideally, you want to mix up your proteins. Grilled Ontario trout or canned (rinsed) lentils or sliced hard-cooked eggs would also make great protein-add ins. 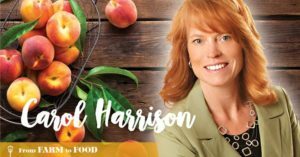 Find out why I like to brag about agriculture and get all the recipes featured in this wonderful cookbook including this salad recipe which I’ve cut and pasted below. From Farm to Food. It’s time to Brag about Ag! How do you like to add carrots to salads? Let me know!